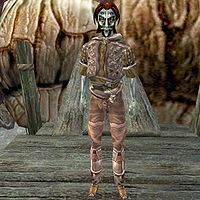 Dravil Bradyn is a Dunmer caravaner who can be found with his Silt Strider in Akamora. For a small fee, he will take you to Necrom, Sailen or Tel Muthada. This page was last modified on 6 March 2019, at 07:38.